The X700 with Minolta MD 16mm f2.8 mounted. The sun-burst was shot by shining a lamp through the back of the camera. This is a short user-review of the Minolta MD 16mm f2.8 Fisheye lens, with a selection of images taken using both Minolta film and also Leica digital cameras. This is the first time that I have used a fish-eye lens, with its immense barrel distortion creating unusually distorted images. This particular lens completely fills the full 35mm rectangular frame, with the image diagonal spanning a full 180 degree field of view. The W-hotel, Barceloneta. Minolta X700 with Delta 100 film and Red filter. The lens that I am using is the final iteration of Minolta’s 16mm fisheye series. Introduced in 1981, it is very much an “old school” lens design that has a mechanical quality comparable to Leica lenses from the same period – perhaps unsurprisingly given that a Leica branded version was released for the R-series SLR cameras. All controls and focussing are fully manual, although with a lens this wide there is almost no need to focus unless you are shooting close-up. The front element is huge, and barely protected by the built-in (and non-removable) hood. When buying a lens make sure that it comes with its dedicated lens cap, as it will be near impossible to find a replacement. There is no practical way to mount conventional filters in front of this lens, but fortunately there are four built-in filters which can be selected by turning a ring – something so convenient that I sometimes wish that all lenses could do this. These cover “normal” (clear), Y52 Yellow, R60 Red and B12 Blue (equivalent to 80B). Older versions of the lens have a slightly different filter types, so check the specifications if this is important to you. As with pretty much any extremely wide-angle lens, the biggest challenge is to find appropriate subjects and framing where unwanted elements do not encroach. I think that it also helps to try to find subjects where the barrel distortion enhances rather than detracts from the image – the magic that this lens can make is only there when you make the best use of its characteristics. Small changes in position can have a dramatic effect on the final image – so much so that when shooting that the viewfinder in my X700 it became clear that the focusing screen is very slightly mis-centered, causing a slight bias in framing. This is a non-issue with any digital camera that supports live-view. The MACBA. Shot stopped down to f22 to show diffraction spikes from the aperture blades. X700 with Delta 100 film. The MACBA, Barcelona. Minolta X700 with Delta 100 film. Mercat de Sant Antoni, Barcelona. Leica M10 with Minolta MD 16mm f2.8 fisheye. Plaça Reial, Barcelona. Minolta X700 with Delta 100 film and Red filter. L’Edifici Colon, Barcelona. Minolta X700 with Delta 100 film and Red filter. Rambla del Mar, Barcelona. Minolta X700 with Delta 100 and red filter. 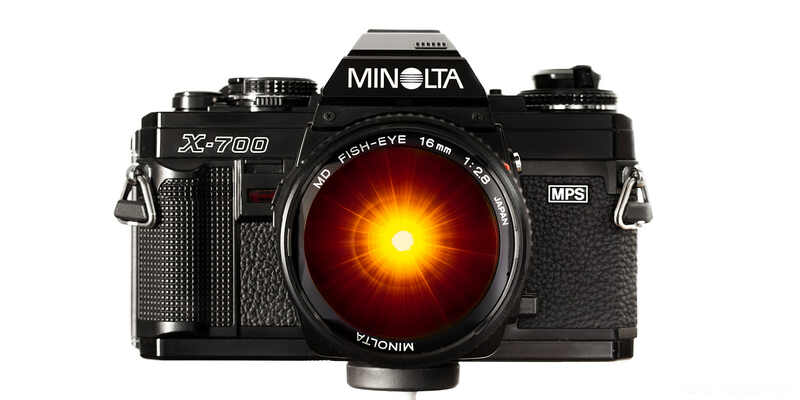 Minolta f2.8 Fisheye Review. Minolta X700 with Delta 100 film and Red filter. Santa Maria del Carmine, Brera, Milan. Leica M10. The amazing ceiling in the Central Post Office, Barcelona. Leica M10. Wide open, the lens is razor sharp in the centre with the corners reaching a similar level or sharpness around f5.6 to f8. In high contrast backlit subjects there is a tiny amount (~two pixels on a 24MP sensor) of purple-fringing at the extreme image edge, but this is well controlled and easily corrected if needed in Capture One or Lightroom. There was no chromatic aberration that I could otherwise see. Overall, I am very happy: there is little to fault the lens optically and I think that the distortion can be used meaningfully. It works perfectly both on original Minolta mount bodies, and also when adapted to a digital camera. Shooting with the fish-eye is also a refreshing change from the somewhat more stressful documentary images that I normally shoot, and the need to think differently about composition and light can only be a good thing. Fantastic photos. Interesting that in the photo of the docked boats that it was hardly noticeable the fisheye warp. There is something so lovely about emulsified film. Ahhh.